The US Patrol Torpedo Boat is a kit that has appeared in various forms over the years, including one branded under the ‘McHale’s Navy’ name, from the US TV series that ran from 1962-1966. 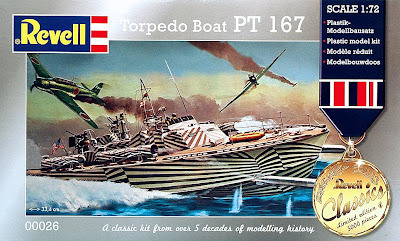 This new Classic Kits release features another boat, PT-167, and a bonus is that it comes in 1:72 standard model scale, matching similar water-borne craft from Airfix. When assembled, PT-167 is 334 mm (13.15 in) long, a size that’s suitable for display on virtually any shelf or desk. PT-167 is noted for surviving a Japanese dive-bomber attack off the Soloman Islands in 1943, including a torpedo hit that went straight through the tough mahogany double-hull - fortunately without exploding! As displayed in the cover art, the kit should be painted in a black and white dazzle finish, which the instructions show in detail, and - this is unusual with model kits - there are useful photographs of a built-up and painted model. 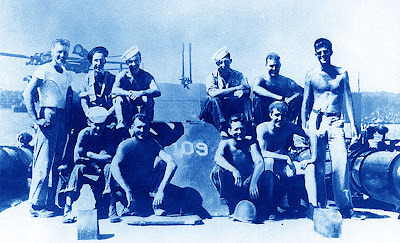 Lt John F. Kennedy, standing at right with other crewmen on board PT-109, in 1943. The kit can also be built as the famous PT-109, commanded from April 23, 1943, by Lt. John F. Kennedy until it was cut in two and sunk by a Japanese destroyer little more than three months later, on August 2. Four figures are included with this kit, and they are suitable for either PT boat, though whether you think one of them looks much like a youthful John F. Kennedy, some 18 years before he became the 35th US President is a matter of choice - or maybe a magnifying glass! 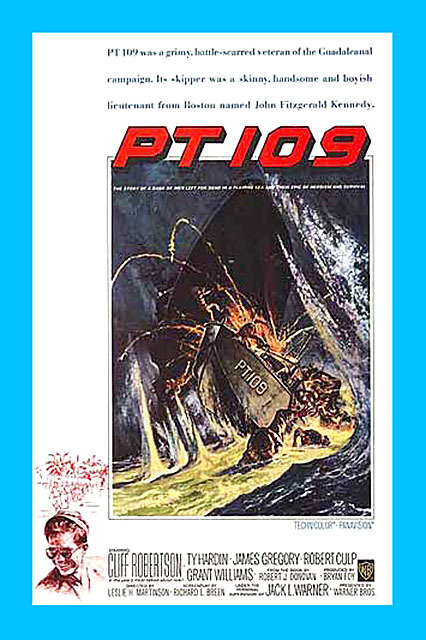 Official US Navy plinth-mounted model of the PT-109. All in all, this is a neat kit that wears its years well. It captures the handsome lines of the original Elco-built boat, and if you’re a finish-freak, that splinter camouflage represents a satisfying challenge to get just so. Like other reissues in the Classic Kits range, the production run is set at 5000, so don’t hang around too long if you want one. A 1963 PT-109 bio-movie starred Cliff Robertson as Lt John F. Kennedy. Review kit kindly supplied by Revell Germany. PT-109 crew picture courtesy Collections of the US National Archives, downloaded from the Naval Historical Center.